The 4-wheeled Cruiser Deluxe uses hand-activated brakes and has a higher weight capacity than the Cruiser. The hand brakes use a patented design known as "Feather Touch". This design means that even users with little hand strength can still operate the brakes. Other features include large wheels, a removable back, a wider seat with pad and hand grips, and the "Lock N Load" locking system. 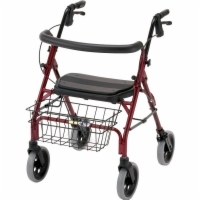 The "Lock N Load" locking system prevents your walker from unfolding once it has been folded, making loading and unloading it a breeze.